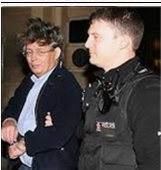 Mr McCluskey, I have no reason to doubt the body of your first statement made to Northumbria Police on 9 May 2007, reason being that you reported what you saw to your hotel night porter and the Portuguese Police on the night it happened, and, your wife confirmed the details. 1. Did you draw the plan (link below) attached to your statement 1? Has it been altered in any way? 2. Did you give the follow up statement to Northumbria Police dated 12 September 2007? If so, how do you explain the fact that in your first statement you describe the woman as speaking Portuguese and you state that you were unable to understand her, and yet in your second statement you state that you believe the woman was Kate McCann? On Saturday 05 May 2007 at approximately 01.50hrs I was with my wife Susan in the holiday resort of ALVOR, PORTUGAL. We were walking up the bank from the town of Alvor in order to return to our hotel, known as the Clube Alvorferias, after a night out. As we approached the junction I observed a white ford transit vehicle drive up the bank and stop well away from the kerb in the junction turning right, blocking traffic turning right. I would describe the vehicle as a flatbed 'transit' vat with a white cab area with white metal fold down side flaps/boards. I recognise the type of vehicle as I used to drive one. I did not notice whether it had any identifying marks of advertising on it. The events of the past week or so, with the McCanns being very much in the news, have triggered my memory in relation to the incident. In my original statement I described a distressed female who ran down a road towards a white van I had described. Having viewed recent news footage of Mrs McCann I am now almost certain that she is the female I described as being in a distressed state. I say this because of her slight build, high cheekbones and her eyes and hairstyle. I've agonised for days over whether or not to contact the police about this because it is a terrible thing to accuse somebody of. It had just not crossed my mind that the child?s parents could in some way be involved in her disappearance. 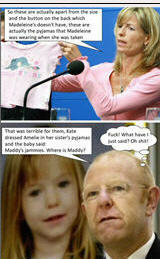 I have watched a good deal of news coverage about the McCanns over the past week or so. Another thing which has played on my mind is the coverage of Mr McCann walking off the aeroplane holding one of his young children. The way he was holding the child over his left shoulder reminded me of the man carrying the child from the white van in Portugal. Although I could not describe the male I'd seen in Portugal because he had his back to me, it was the particular way Mr. McCann held the child that made me think. He held the child over his left shoulder with his left arm supporting the child?s weight. 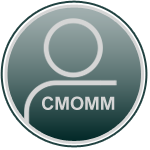 Thank you in anticipation - I can be reached via this forum. Wouldn't this be easy to check by contacting the owner of the said vehicle, wasn't it a Ukranian?, and seeing if his wife does look anything like Mrs McCann? Yes, the hand written note on Mr McCluskey’s first statement says the couple were Ukranians from Alvor with their daughter Loira. We have to assume that this was written by the PJ? I don't think the woman's appearance is the main issue, although it would be interesting - Susan McCluskey describes her as about 5'6" tall, with a blonde pony tail. What I really want to know is why does Richard McCluskey, after only 4 months, seem to entirely forget that the woman he encountered couldn't speak English - how could it possibly be Kate McCann he tried to speak to? How could he possibly be confused over this? Who produced this second statement? Don't forget this second statement was apparently triggered by the McCanns return to the UK which McCluskey saw on the news. I've pointed out before the similarity in what he says about the way in which Gerry carrys Sean off the plane to what Martin Smith says in his second statement, which is dated 20 September (a week later than McCluskey's second statement). Origin: Mr Martin Smith Ireland. Text: Reported that he had passed a male carrying a child in Praia da Luz the night Maddie went missing. Went and made a statement to Portugal police in Portimao on 26th May and returned to UK. Is saying that after seeing the McCanns on the news on 9th Sept when they returned to UK he has not slept and is worried sick. He states he was watching the 10 PM on BBC and saw the McCanns getting off the plane and coming down the steps. He states it was like watching an action replay of the night he saw the male carrying the child back in Portugal. He states the way Gerry was carrying his twin triggered something in his head. It was exactly the same way and look of the male seen the night Maddie went missing . He also watched ITV news and Sky news and inferred it looked like the same person both times carrying the children. I don't know whether she could speak a little Portugese or not (a couple of sentences to someone who can't speak that said language could easily confuse them) but she did speak it on a youtube video...granted this may have been a prepared or practised statement. @JohnyT - I assume by 'she' you mean Kate McCann. Yes, she memorized a couple of sentences in Portuguese for the appeal she made to the Portuguese public. We could not understand her and at this point we were the only other people on the street; but as we were talking a young Portuguese couple appeared from (page 2) the same direction as the woman in a small red vehicle and stopped. The male came over and was able to speak good English he translated what the woman was saying. I don't see how, if this account is true, McCluskey could possibly think the woman was Kate McCann a few months later. It simply does not make sense. It may seem a minor point - but IMO it isn't. I believe either one or both of his 2 statements have been altered. The child was the approximately the same age as Madeleine and similar in looks. A very odd story about not being able to get a babysitter so a row and violence had erupted. Strangest part of all, the father had disappeared back home with the little girl leaving the mother and baby of the family behind in Portugal when the Portuguese police checked on them. I wonder if the PJ ever checked the child WAS actually with her father. The entry for the McCluskey statements in the files is misleading. The child that McCluskey saw was called Loira and she lived in Alvor with her parents, who we are told had argued over baby sitting. The Ukranian man/child who went back to Ukraine leaving the wife is a completely different family who live just outside Porto in Leca do Balio (up at the very top of Portugal). For some unfortunate reason (probably because they were both Ukranian) the two inquiries have been linked on the same page in the translations. This info can be ignored in terms of McCluskey. How very confusing. 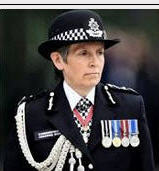 Are you saying there are two different police enquiries concerning two unconnected families and unconnected incidents that have inadvertently been linked? The whole thing always seemed strange to me but at least it's good to know that my 'antennae' for strangeness hasn't deserted me yet! Thanks for that. @Kaz – yes, that’s right. Ukranian couple 1, from Alvor (south coast near Lagos), with daughter Loira, apparently seen by the McCluskeys in the early morning of 5 May and statements given saying dark-skinned male and Portuguese speaking wife. Then in a later statement made by McCluskey (September 07), the couple were suddenly described as almost certainly being Gerry and Kate McCann. How could that be? This is the arguing ‘baby sitter’ couple. Ukranian couple 2, from the north of Portugal, who were investigated after a tip off because their 4 year old daughter Iliona, looked liked Madeleine. This is the father who returned to the Ukraine for a visit with his daughter, leaving wife/baby son back in Portugal. This has nothing to do with the above statements but has been linked together on the same translated page of the files. 3. The second statement was fabricated by McCluskey – why would he do this when he would be aware that what he was now claiming was at odds with his first statement and, under normal circumstances, would be questioned straight away? 4. The second statement was fabricated by a third party, for whatever reason. We have to remember that McCluskey’s second statement co-incided with the McCanns returning to the UK, the video of GM carrying Sean off the plane, and, with Smith’s very similar second statement about ‘Smithman’ being Gerry. Did McCluskey/Smith make either of these 2 second statements? Were they coerced or did they have any hand in them at all? There is a clip on You Tube of Jane Tanner . When she is describing the way the person is carrying the child. She slips and says the way I was carrying. I cannot provide a link but is easy to find.. (Im an oldie and not very tech wise ! ) My apologies if ive put this in the wrong place. The McCuskey statements have always struck me as very odd. In the case of the Alvor couple (both Ukranian?) we are given to understand that they were in the middle of a blazing row and that the husband's gait looked as if he were drunk. I find it odd that they would speak to one another in anything other than than their mother tongue in such circumstances. Most bilingual folk automatically revert to their first language when speaking with a fellow countryman or family member, especially when stressed or impassioned. I would have expected the row to have been in Ukranian/Russian. Perhaps Mr. McCluskey couldn't spot the difference but why he would later imagine that Kate was so fluent in another tongue that she could argue like a native speaker is beyond me. Surely he noticed that this woman could not communicate with him in English? Why then would he later state that he was sure she was Kate? Something very fishy here! @Maxbex wrote: There is a clip on You Tube of Jane Tanner . When she is describing the way the person is carrying the child. She slips and says the way I was carrying. I cannot provide a link but is easy to find.. (Im an oldie and not very tech wise ! ) My apologies if ive put this in the wrong place. This is snipped from two different articles and I have two questions. 1: Is this the same Robert Henderson who was working as a consul in the Algarve? 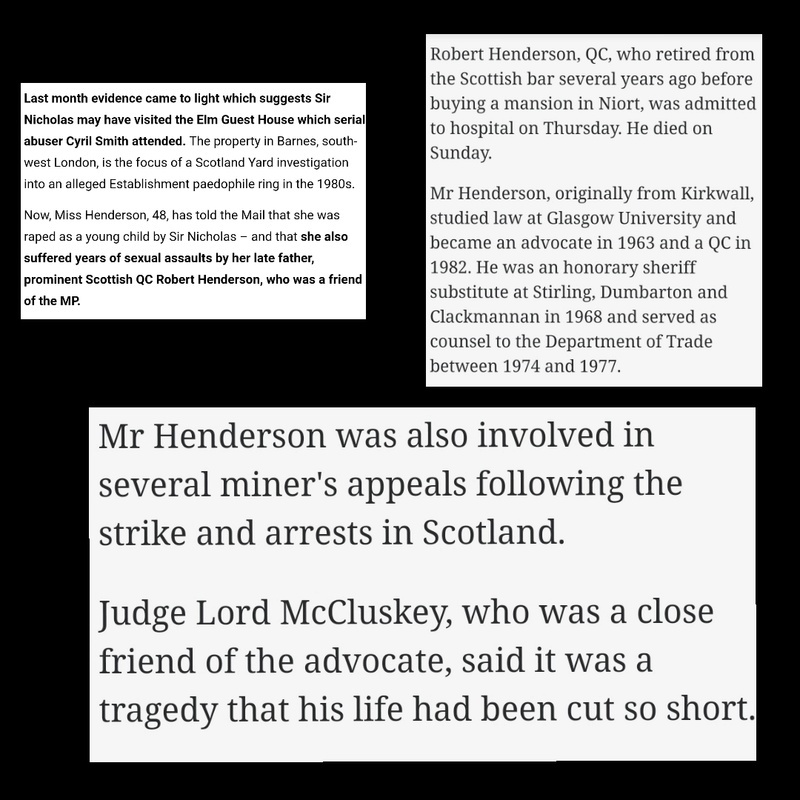 2: Do someone knows if Lord McCluskey is/was related to Richard McCluskey? Robert Henderson QC one and the same as Robert Henderson UK consul to Portugal in 2007? No, definitely not! In a different league altogether. Lord McCluskey related to Richard McCluskey? Anything's possible but I doubt it very much. It's not exactly an uncommon name - I can't see any reason to link the two.. Duplicate - sorry, having problems posting! Yes, @NickE, I agree with all @Verdi has said above. For some reason, through incompetence or by design, this obviously did not happen. Had Robinson had copy of the first statement he would have noticed the anomalies in McCluskey's claims. Had the 2 statements been joined whoever read them then or in any future re-investigation would have immediately realised that McCluskey's blonde was a non-English speaking, Portuguese speaking Ukranian in the first statement and a non-Portuguese speaking scouser in the second. Why the delay in sending the second statement through? Technical difficulties my a***. The content of the 2 statements is not my focus (although the similarities with Smith's claims are striking), it is the possible alteration/fabrication of statements/documents/records which is interesting, IMO. If this were a simple abduction, there would be no need for any falsification, other than perhaps on a small scale by MW staff (e.g. nannies). "AN EPIDEMIC OF FALSE SIGHTINGS AND FALSE CLAIMS"
I am reproducing in this thread, below, a post made by @ skyrocket on another thread today. It relates to this most extraordinary sequence of events in September when two APPARENTLY unrelated people, namely Richard McCluskey and Martin Smith, made near-identical calls to the police, purportedly claiming to have 'recognised' Gerry McCann as the man they saw carrying a young blonde girl in May 2007. Both men claimed in almost identical words that they 'recognised' him by the way he was walking and/or carrying his son Sean. This is such a strikingly coincidental occurrence that it positively cries aloud for investigation. We are very fortunate to have @ skyrocket as our 'lead researcher', so to speak, on this issue - which I regard as one of the keys to this whole mystery. 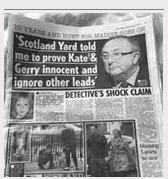 Let us remember that Martin Smith's testimony on this matter was regarded by Operation Grange and the BBC as 'the centre of the focus' of the Madeleine McCann enquiry back in 2013 - and that some regard Martin Smith's claims as 'proof' that Gerry McCann was hurrying towards the beach at about 10.00pm on 3 May 2007, carrying his dead daughter to a place where he would hide Madeleine's body where it would never be found, then calmly return a few minutes later to the Ocean Club. ‘It has been suggested in the past that the documented McCluskey statement had been manipulated, or partly forged, re-written - call it what you like, by someone in authority, probably the most ridiculous suggestion I've read in the history of this case. Keep it simple’. What – do you mean in the same ridiculous way it was suggested in the Hillsborough case? It was simple, and they simply thought that they’d get away with it. I have no idea whether there was collusion pre or post statement taking in terms of the McCluskeys – I have suggested the latter but it may be both. What I do know is that no sane person makes two police statements, 4 months apart in which one of the main protagonists can only speak Portuguese in the first and is a scouser in the second. - why was the second statement taken hand written? - why was the first statement said to be (conveniently?) not available to the interviewing officer when he took McCluskey’s second statement? If Robinson had read it he surely would have brought up the language issue. - why in his covering letter to Op Task, does the interviewing officer (Stephen Robinson) not even mention the revelation that Gerry was the man McCluskey saw carrying the child, despite explaining that McCluskey is implicating Kate? Surely the first point would take priority if it had been stated by McCluskey? - why is the second page of McCluskey’s original hand written statement missing from the files? The first page ends after pointing the finger at Kate, the second ‘missing’ page seems to have been dove-tailed in to the comments made in the last para of Robinson’s covering letter. - the McCluskey/Smith second statements are far too closely linked time wise for my liking. I am not restricting my views on manipulation solely to McCluskey’s second statement – I believe there is at least a possibility that there was an epidemic going on. 2) Did you read ALL the pages of your entire statement. 3) Did you witness ALL pages of your entire statement. 4) Why did you make this statement in Sept when the people you had seen had already been identified and eliminated from the investigation. 5)Does this statement accurately reflect what you allegedly said. 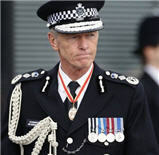 @Tony Bennett wrote: "AN EPIDEMIC OF FALSE SIGHTINGS AND FALSE CLAIMS"
Tony, if you embrace this so-called leading research, you are not only considering but you are agreeing that the UK police (jointly it would appear) falsified legal documents in the forum of a witness statement - because that's the implication here. Not only did they possibly falsify a legal document but they did so in order to implicate Gerry McCann - the very suspect who has been so well protected by the UK authorities for the past twelve years? I refer you to the relevant text posted by the researcher (please bear in mind these documents are the property of the police).. It doesn't make any sense, at least not to me. It only adds confusion to an already overly complicated mystery. The second McCluskey statement, IMO, far from being damaging to Gerry McCann is a remarkable "stroke of luck". Here is a man, so whipped up by lurid media reports, that he insists on going to the police, AGAIN, about having seen a man and woman (long since investigated and eliminated from the investigation) arguing in Portuguese in full public view over a child the night AFTER Madeleine disappeared. Ergo he and his claims are ridiculous. He allegedly claims to have recognised Gerry as the man (now identified by police) from his descent of the plane upon the McCanns return to England. The clear implication is that such a claim is patently ridiculous, and other claims in the same vein should be consigned to the "fevered imagination box". Including the Smiths' claim. Nice job done of undermining the Smith Sept. statement. And no, I don't think it far fetched to suggest the police were trying to undermine the P.J. case and protect the McCanns. Dr. Amaral and his team reached that conclusion long before McCluskey's convenient, daft second statement! I fear you have misunderstood me. No doubt the fault is mine. I headed my post: "AN EPIDEMIC OF FALSE SIGHTINGS AND FALSE CLAIMS". I was specifically referring to the witnesses in the case who made false statements and not those actions of the police. I am grateful to @ skyrocket because IMO he brings us valuable insights into some important areas of the case. He steers fairly clear of the robust arguments which rage here from time to time. skyrocket has offered some alternative explanations for the very remarkable coincidences between the Smithman and McCluskey sightings. I haven't had time to digest them yet. I doubt whether the Metropolitan Police would tamper with statements in this case BUT as you know I firmly believe that the security services have grossly manipulated this case, so nothing would shock me. And I have seen enough proof of police corruption in other UK cases to know how liable cases are to manipulation. I hope that clears up the misunderstanding. I will sign off this post by saying that I would genuinely welcome ANYONE who can give a credible explanation of why two men (possibly both Irishmen) should within a few days instantly 'recognise' Gerry McCann on the basis of a few seconds on a TV clip, over four month after the event. All contributions will be viewed with great interest! Possibly have morphed into anyone resembling Gerry McCann! At least the Smiths' early statements re. a light skinned man, with athletic - slim build and short light brown to brown hair matches Gerry McCann! SOMEONE is attempting to take the mickey with the inclusion of the second McCluskey statement methinks! Tony wrote: I hope that clears up the misunderstanding. No Tony, it doesn't clear up any misunderstanding - it only adds to the confusion. 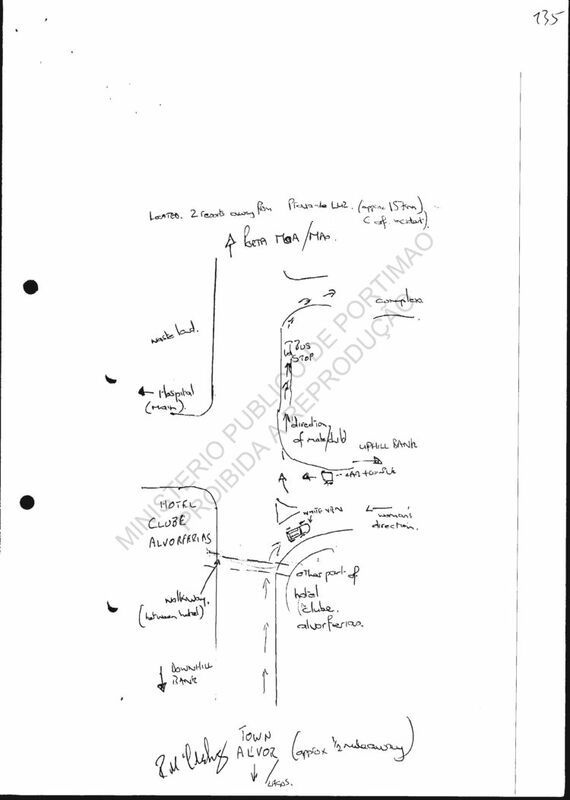 The member hasn't offered some alternative explanation for remarkable coincidences between the Smith sighting and the McCluskey sighting, the member is suggesting that the UK police tampered with official documents in the form of witness statements based on no evidence but a missing page and a difference in handwriting. I don't dispute that the police are capable of falsifying evidence in certain circumstances but in this instance it's beyond the pale. If the secret services are involved, they are far more adept at subterfuge than so naively altering a witness statement to be included in official documentation relative to a serious crime. Just imagine if the case was ever to reach a court of law - would the police or MI5 or the government so readily expose themselves to humiliation and ridicule? As I said earlier, it only serves to incriminate Gerry McCann, the very person they strive to protect. Is that likely? Based on the evidence before us, I venture to suggest, again, that the McCann accomplices offered pecuniary incentive to bear fase witness, just as they did across Europe and North Africa - even as far away as the Antipodes. Please find attached a witness statement provided by Richard McCluskey. Firstly may I apologise for the delay in forwarding but the system crashed at this end and the problem has taken some time to resolve. Mr. McCluskey states he has already provided a witness statement in relation the enquiry having been on holiday in Portugal at the relevant time. He provided a statement in relation to suspicious activity he observed in the early hours of Saturday 5 May 2007.In the original statement Mr. McClusky states he described a male alighting a white coloured van and walking along a road carrying what appeared to be a motionless child. He then states he observed a distressed female run down a road and approach the same white coloured van. Mr McCluskey did go into detail regarding the incident but then stated that all details were covered in his first statement, provided in May 2007. Not having had sight of the original statement it is obviously difficult to comment on the context and accuracy of the account given. Mr. McCluskey states the thought had never crossed his mind that a child's parents could be implicated in such a matter. Media coverage over the past week or so has cased him to take a renewed interest in the case. The only thing which prevents Mr. McCluskey from stating he in 100% certain in his "identification" is the fact that he would , in his words, " hate to incriminate and innocent person." ANOTHER QUESTION FOR MR. McCluskey. 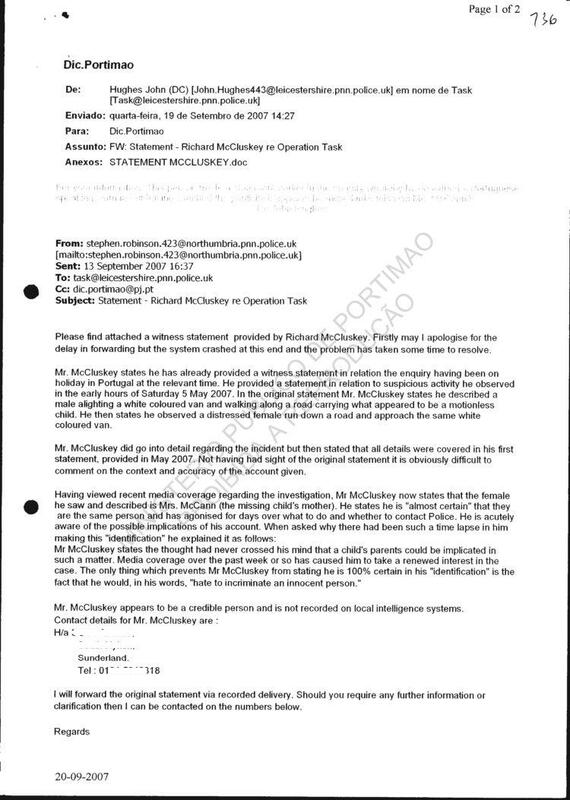 Why does the above letter sent from Stephen Robinson @ Northumbria Police on Sept 13th 2007 to Operation Task @ Leicestershire Police make absolutely NO reference to your alleged claim to have recognised Gerry McCann from his descent of the plane steps. In ALL OTHER ways it is a comprehensive paraphrasing of your second statement and accords EXACTLY with the hand written section of said statement which is available to view. Why would Stephen Robinson omit this important detail - ie. your identification of Gerry McCann - from an otherwise completely accurate reprise of your second statement. 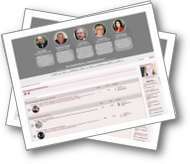 For information, forum discussion initiated in February 2012..